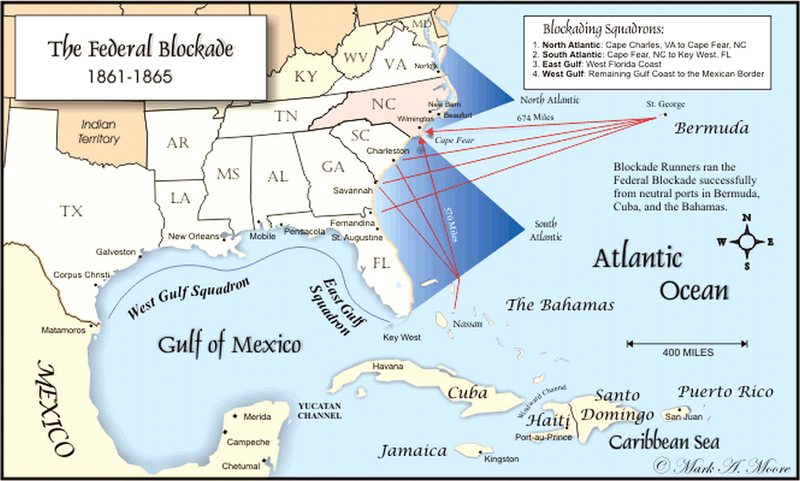 During the early part of the war, blockade-running was carried on front the Capes of the Chesapeake to the mouth of the Rio Grande. It was done by vessels of all sorts and sizes. The most successful were the steamers that had be-hinged to the Southern coasting lines, which found themselves thrown out of employment when the war broke out. The rest were small craft, which brought cargoes of more or less value from the Bahamas or Cuba, and carried back cotton. They answered the purpose sufficiently well, for the blockade was not yet rigorous, speed was not an essential, and the familiarity of the skippers with the coast enabled them to elude the ships-of-war, which were neither numerous nor experienced in the business. By April, 1861, the greater part of the last year's cotton crop had been disposed of, and it was estimated that only about one-seventh remained unexported when the blockade was established. Cotton is gathered in September, and shipments are generally made in the winter and spring, and considerable time must consequently elapse before a new supply could come into the market. The proclamation of the blockade caused for a time a cessation of regular commerce; and it was only after a considerable interval that a new commerce, with appliances specially adapted to the altered state of things, began to develop. Meantime illicit trade in a small way flourished. The profits were considerable, though not comparable to those of later years; and the work required neither skill nor capital. This guerrilla form of contraband traffic gradually decreased after the first year, though there was always a little going on from the Bahamas, and on the coast of Texas. By the end of the second year it was only to be found in out-of-the-way nooks and corners. Little by little the lines were drawn more tightly, as Dupont threw vessels into the inlets below Charleston, and Goldsborough into the Sounds of North Carolina, while the blockading force grew from a dozen vessels to three hundred. In all the squadrons the burning and cutting out of schooners gave frequent occupation to the blockading forces, and the smaller fry were driven from their haunts. As these vessels were captured or destroyed one by one, there was nothing to replace them, and they gradually disappeared. One of the prettiest captures made off Wilmington was that of the Ella and Anna, by Acting Master J. B. Breck of the Niphon, in the following November. Breck was an officer of pluck and resource, and he won a name for himself by his dashing successes on the Wilmington blockade. About five o'clock on the morning of the 9th of November, as he was returning along the shore from a chase near Masonboro Inlet, he discovered a side-wheel steamer to the northward, stealing along toward the entrance of the river. Outside of her lay a blockader, which opened on her with grape, and the blockade-runner, finding herself intercepted, steered directly for the Niphon with the intention of running her down. Breck saw the intention, and fixed on his plan in an instant. Heading for the steamer, he formed his boarders on the bow. The blockade-runner dashed on at full speed under a shower of canister, and struck him a blow that carried away his bowsprit and stem. In a moment, his boarders were over the rail and on the deck of the blockade-runner; and a few seconds made her a prize. She had on board three hundred cases of Austrian rifles and a quantity of saltpetre; and the prize-sale netted $180,000. The Ella and Anna was taken into the service, and in the next year, under her new name of the Malvern, became famous as the flagship of Admiral Porter. Besides the money received, officers were able to stow away little cargoes of their own, and so to make on each trip a private speculation; and an occasional cotton-bale was brought out for a friend, by way of making a handsome present. In fact, the blockade-running captains, after six months of employment, could afford to retire with a snug competency for the rest of their life. The merchants who withdrew early from the business acquired considerable fortunes; but those who kept on until the end met with heavy losses. Any speculation that brings sudden and excessive profits is likely to be overdone; and large amounts of capital were sunk in the last months of the war. At the close, the thriving business of Nassau and Bermuda suddenly collapsed, and they reverted to their former condition of stagnation; while the mercantile enterprise of Liverpool was directed to other and more legitimate channels. The second is that of the anti-American attitudes of British politicians, far more extreme than conventional histories let on, and U.S. Ambassador Charles Francis Adams' heroic fight against them. The third is a thoroughly readable narrative of the raider Alabama and her capable, quirky captain, Raphael Semmes. 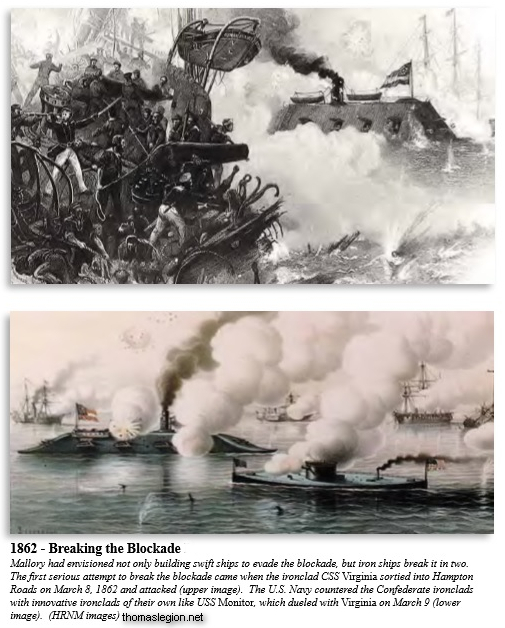 The final story is about the Alabama claims--suits for damages done to the U.S. merchant marine by Confederate raiders, which became the first successful case of international arbitration. Sound and remarkably free of fury, DeKay's commendable effort nicely expands coverage of the naval aspects of the Civil War. Recommended Reading: Confederate Raider 1861-65 (New Vanguard). Description: The Confederate states adopted radical solutions to counter the naval superiority of their opponents. One of the more successful solutions they adopted was the use of commerce raiders. This book describes the reasons which forced the Confederates to resort to commerce raiding, and outlines the way in which these craft were converted or specially built to perform their role. It details not only the way these craft were operated and manned, but also their brutal attacks, daring escapes and climatic battles against the large numbers of Union warships forced to hunt them down.